SMi are delighted to have interviewed our speaker Maxime Gaillot, Senior Device Engineer, Roche, for Injectable Drug Delivery! Maxime Gaillot works for Roche since 2011. He has 15 years’ experience in the medical device and polymer industry. After some years, in the plastic closure industry, Maxime started his career in the Medical Device industry at Novartis. He worked on the development of a dual chamber pen injector and an electronic reusable injector. Since 2011 at Roche, he was a single mater expert for Needle Safety Device and supported the filing for a Rheumatoid Arthritis treatment and the development of the Roche Needle Safety Training Device. Q. What will the conference attendees be able to learn from the presentation? Q. 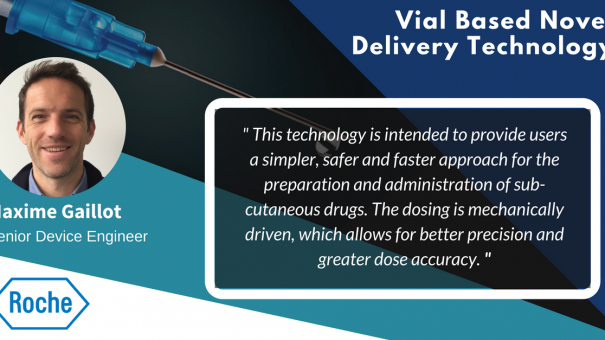 How will vial based delivery technology impact the end users, patients? Q. What are the most exciting emerging technologies?